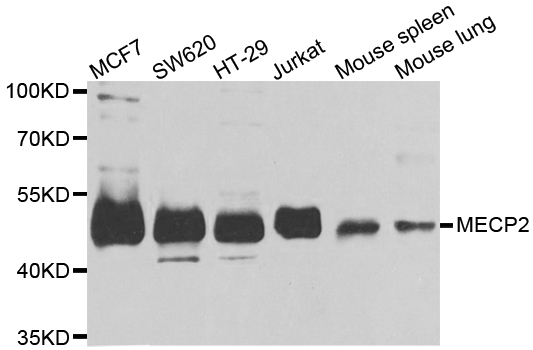 Western blot analysis of extracts of various cell lines, using MeCP2 Polyclonal Antibody. DNA methylation is the major modification of eukaryotic genomes and plays an essential role in mammalian development. Methyl-CpG binding protein 2 (MeCP2), which can bind to methylated DNA in vivo and in vitro, may serve as a methylationdependent transcriptional repressor by association with known co-repressor proteins, which include members of the histone deacetylase protein families. 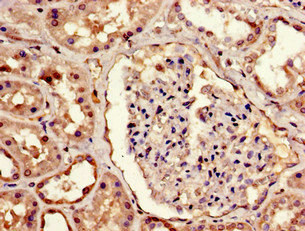 MeCP2 Polyclonal Antibody. Unconjugated. Raised in: Rabbit.